The Lesser Slave Lake Regional Forest Management Plan will hold an Open House in Valleyview on April 28, 2018. Visit us at the Freson Bros from 10:00 am - 3:00 pm to learn more about the plan, see proposed VOITs, and provide feedback. See Engagement Opportunities for more information. The Lesser Slave Lake Regional Forest Management Plan will hold an Open House in Swan Hills on April 26, 2018. Visit us at the Keyano Center from 4:00 - 7:00 pm to learn more about the plan, see proposed VOITs, and provide feedback. See Engagement Opportunities for more information. The Lesser Slave Lake Regional Forest Management Plan will have booths at two upcoming trade shows in north central Alberta. Introductory information will be available as well as the VOITs (Values, Objectives, Indicators, and Targets). Visitors will have a chance to learn about forest management and provide public input. See Engagement Opportunities for more information. 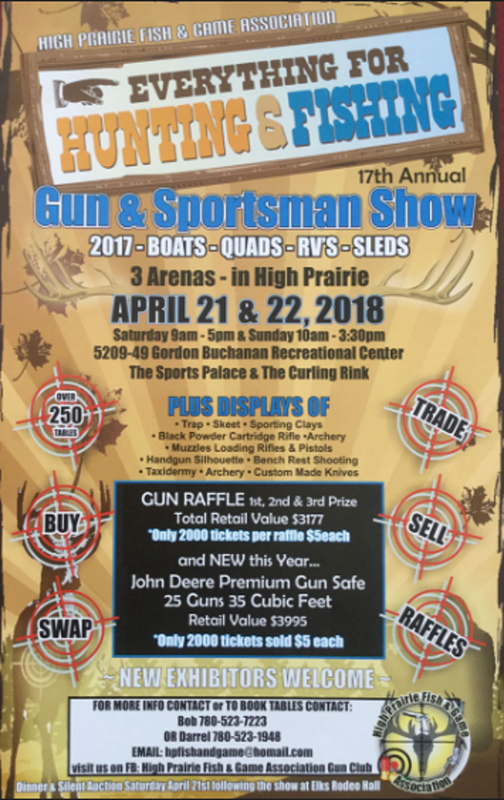 Visit us at the High Prairie Gun & Sportsman Show April 21st-22nd, 2018 and the Slave Lake Outdoor Adventure Trade Show May 4th-5th, 2018!